Time reporting is often a question of profit or loss on a project. This is especially true for consulting companies – legal, HR, management or IT consulting. Project costs here are largely determined by the time spent by experts on the project. Now, how long does the task of reporting your hours take? If you are a project manager – how much time do you waste on constant please-fill-in-you-hours reminders? Tiresome and unproductive. Our company used to face these challenges too. Today we’ll share our experience: How we improved time reporting efficiency with an Outlook Add-in. 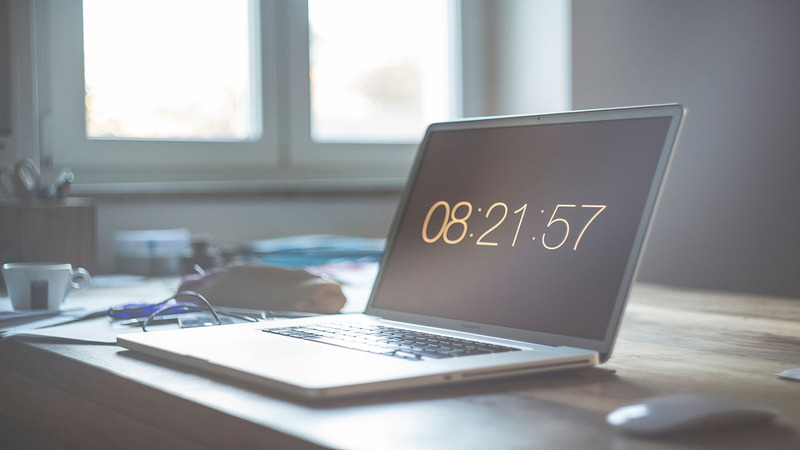 In IT consulting projects, the number of hours put into development, testing and deployment determine the bottom line investments into a project. Time reporting in our company is realized with Singlepoint solution. Briefly, Singlepoint is a platform for business process automation, where you can create and combine different features like a construction set. We have customized one of the modules and now use it heavily for time reporting on our projects. At the end of the workday, an employee received a reminder in Outlook to fill in his/her hours. The employee opened the reminder and followed the link to K-Point. The employee logged into the system. The employee filled out the time report for the day for each project. Unproductive and inconvenient: although it was an automated process, completing all four steps took unreasonably long time. Putting aside: employees would frequently put these evening reminders aside and later forget about them. Some created special folders in Outlook, where these notifications piled up unattended. The longer employees would put off time reporting, the more difficult it was to remember how many hours they actually spent on a project. Inaccurate estimations and planning: consequently, project managers could not see the actual picture of time input necessary for accurate planning and resource allocation. In the morning, the Singlepoint add-in sends an employee a reminder in Outlook. Since all activities can be completed directly in it now, the reminder is treated somewhat as a “ticket”. The employee opens the “ticket” any time during the day and fills in his/her hours directly in Outlook. At that, there is no need to switch to an external system (Singlepoint in our case). More productive: the number of steps decreased twice, which saved time for employees, as well as project managers. 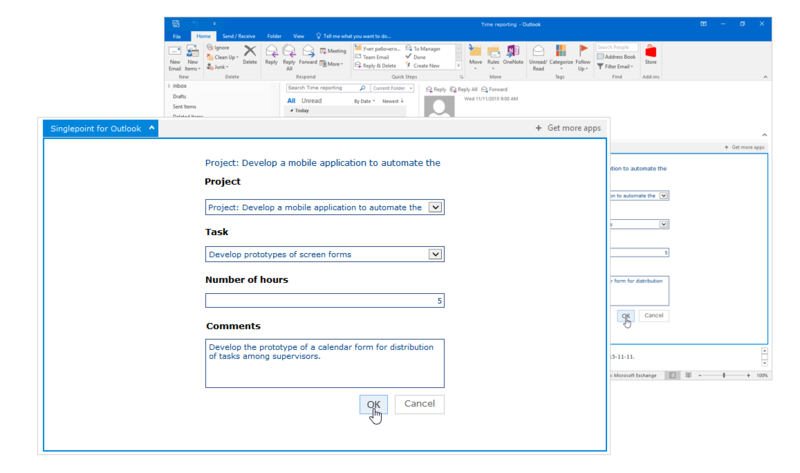 More convenient: the add-in allows us to fill in and send time reports for a specific workday directly from Outlook interface. When the report is submitted, the notification message can be simply deleted – this would mean the “ticket” is completed. Timely reports: employees changed their attitude towards the task. The reminders are no longer treated as annoying spam, which gets filtered into a deserted folder. Instead, a reminder is treated as a Call-to-Action which should be and can be done on time. Accurate data and planning: now project managers do not have to chase each employee with constant reminders. Managers receive timely and accurate reports, and this simplifies overall project management. On top of that, the add-in is available not only in the desktop version of Outlook, but in Outlook Online and mobile devices as well. This is quite useful for frequent business trips, for example. Adoption of Singlepoint Add-in for Outlook allowed us to cut down the time we spent on time reporting twice and increase the quality of time reports. Besides, the add-in is not meant for time reporting exclusively. It is a logical extension of Singlepoint system, and it can be easily set up for other target processes. There are plenty of time reporting, time tracking and project management software available on the market. Whichever system your company has in place, the Office platform allows us to develop similar Outlook add-ins nearly for any system. Based on our experience and customer feedback, the time reporting bottlenecks we faced are rather typical. For IT consulting, or for any legal, human resource or management consulting. The add-ins, however, can support any highly specialized processes in a company. Got a meeting scheduled – send a report to CRM directly from the letter, etc. It may seem like these are small insignificant things, but they do save from daily headaches. If this got you thinking right now: “I wonder if it’s also possible to…” Email us! We are sure it is possible. We professionally develop add-ins for Office and Office 365 and we are up to speed with the latest features.